I started listening to Kristin Hannah’s The Nightingale on audiobook and stopped several times this year. I would get through the first few chapters, as an older woman relays a tough childhood in France, then lose interest. I read a lot of books, I don’t really push through if they don’t capture my attention. Recently, however, Audible named The Nightingale Audiobook of the Year, so I decided to give it another listen. And this isn’t a poor orphan story, but a war story. It’s a World War II story. And most importantly, it’s a lady story. A novel about how war affects women, and how women affect a war. Author Hannah read about the roles of French women in the resistance during World War II, most notably Adrée de Jongh, who smuggled fallen airmen out of France through the Pyrenees mountains. She also read about women who quietly sheltered Jewish children or were forced to house German soldiers, and realized she had to tell these stories. Her research helped her create The Nightingale‘s Vianne Mauriac, whose husband has left their small village to fight at the Front. While he’s gone, it is up to Vianne to tend to her small daughter, and find some way to survive with German soldiers who invade her home. Vianne’s younger sister, Isabelle, was rebellious before the war started. Once it begins, she is determined to join the resistance in any way she can. Both these women will be tested in endless, exhausting ways. Isabelle flees from Paris in a gigantic, desperate swarm of refugees. Vianne’s best friend and next door neighbor is Jewish, and Vianne witnesses stricter and stricter restrictions placed upon her. I don’t often read historical fiction, but this book kept me going, equal parts horrified, intrigued, and entranced. I listened to this audiobook in the same time period that I watched Amazon’s The Man in the High Castle, and it was Nazi overload. I would not recommend it. I’m now grateful I’m not living in Nazi-occupied France or Nazi-occupied America on the daily. My main issue with the book, as powerful as it was, is the message that women after wartime don’t talk about their tragedies and triumphs. I guess you’ll have to read the book to know what I’m referring to here, but that a mother could keep such a large secret from her son seems odd to me. I’d be interested to know how everyone else felt about this message. I wonder if Hannah absorbed this from her research, that earlier generations were simply more stoic about doing what needed to be done? Anyways, check it out! Report back with your thoughts. Also, movie rights for this one have been picked up so… that’s exciting! I’ve debated how to review Lauren Owen’s The Quick since finishing it a few days ago–I don’t think this is a novel with a twist, as much as it is a novel which dedicates a bit of itself to misdirection. Even the cover could be misleading, as I realized through summaries that this was going to be a novel of secret societies and suspense, but I assumed it would be more in the literary vein, like Alena Graedon’s The Word Exchange. The Quick seems to tell the story of James and Charlotte Norbury, growing up with a distant father in their treasured but disintegrating Askew Hall. Where generations of the Norbury clan lived lavishly before them, James and Charlotte are mostly left to their own devices, losing track of time amidst old statues in the garden or building their bravery by creating tests of courage in the library. James grows into a young man and sets off for the big city of London, as young men are wont to do. He’s determined to be a writer, and rarely leaves his flat, sitting up at his desk all hours and staining his hands with ink as he creates long classic poems. He finds himself living vicariously through his roomie Christopher Paige, who comes home late to divulge tales of London high society, heavy drinking, and debauchery. But the story here hasn’t really begun, because much more than friendship is brewing between the aristocratic Christopher and the meek James. And even then, the story hasn’t really begun, because at a dinner party, James notices that Christopher’s brother looks ill–he seems so pale, and is he wounded? Is he bleeding? As the book doesn’t directly introduce its subject matter, some readers may be frustrated. 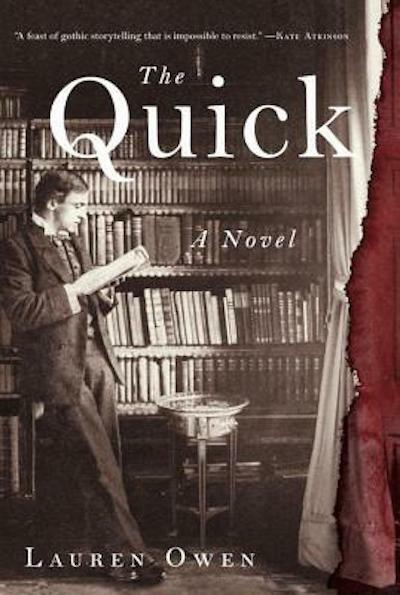 The Quick is a historical novel, yes, but it is a supernatural historical novel. All this high society, all this classic London aristocracy–there is something horrible bubbling underneath. There are fight scenes, there are wild street children getting shot in the feet, there are fires and desperate carriage rides to safety. The book includes journal entries, scribbled and ripped in places. Those hoping for the story of James and Charlotte to continue as it did in the style of the book’s beginning may be dismayed, as reality shifts around them, and the narrative drastically changes. If you are seeking a mild-mannered historical novel, you may want to look elsewhere. If you are interested in what might be crouching in the shadows of that mild-mannered historical novel, overlooked and unexplored, then you’ll want to pick up The Quick. The Quick reviewed on the New York Times Sunday Book Review – with all the spoilers I didn’t give, for those curious. In a sea of uninspired Young Adult books, each struggling to be the next Hunger Games mega-hit in a battle so fierce it might as well be taking place in Panem, reading A Death-Struck Year by Makiia Lucier was, counterintuitively, like an honest and gripping breath of fresh air. A Death-Struck Year shouldn’t feel so fresh because it takes place in Portland, Oregon, in 1918. For those of you who aren’t familiar with recent history, the Spanish flu (now known to be a variant of the H1N1 virus–ready to get your flu shot yet?) spread like crazy between 1918 and 1920, and killed 3-5% of the world’s population, ultimately killing more people than World War I. A Death-Struck Year’s unsuspecting heroine Cleo, 17 years old and pensive about her future, watches in alarm as the pandemic closes in around her. First, the reports of sickness are distant, only in papers and heard as vague rumors; then Cleo notices restrictions on travel in town, and masks on faces of travelers; finally, she finds herself in a terrifying situation, as the city shuts down completely and people die in the streets or unnoticed in their homes. The virus creeps into the community quick, and it is easy to feel Cleo’s confusion. Early on, Cleo’s school keeps a watchful eye on its students’ sneezes, but then it makes the decision to shut its doors completely. With family out of town, Cleo finds herself home alone in the middle of the flu pandemic. When the Red Cross calls for able women to assist the sick, Cleo shyly responds to the request, finding a bedraggled and understaffed Red Cross staff desperate for help. Before she fully comprehends it, a testament to how quickly pandemics seemingly spread, Cleo is driving her brother’s car around town, knocking on doors, educating her neighbors on the virus, calling help for the ill, and, sadly, discovering the dead. Cleo finds comfort and friendship among the overworked staff at the Red Cross emergency triage center set up in Portland’s auditorium, where nurses, army doctors, and community volunteers group to battle the illness. Together they struggle through the pandemic, relishing small triumphs and mourning the much greater losses they suffer. A wounded army doctor catches Cleo’s eye, and a romance develops. It seems like young readers are hungry for smarter material, and I think A Death-Struck Year is on the right track. Teens know there is more to a crush than a fast heart beat; there is more to suspense than a fight scene. Lucier has managed to create a gripping story that resonates as honest. Cleo must find in herself unimaginable bravery, and she is a strong heroine–but rather than drop Cleo’s character development as the action develops, Lucier is able to build her into a real young woman that could be any reader of the book growing up in a different time, rather than a caricature of what a girl should be like or think like. Lucier has studied up and written with a painstaking attention to historical accuracy, and the attention to detail certainly shows in the book. Although at a higher reading level (age range is 12 and up), A Death-Struck Year reminded me of the American Girl books I used to read when I was a younger child. They would recount the struggle of a young girl in a pivotal time in history. I don’t read a ton of historical fiction (although I am currently reading The Invention of Wings by Sue Monk Kidd) but I understand how following a young woman through a more turbulent time in history could appeal to a Young Adult reader in the same way a dystopian novel would, but with a more grounded twist. Lucier reminds us of tragedy which took place in years not too far past, and the ability of history to tell us its thrills and heartbreaks. 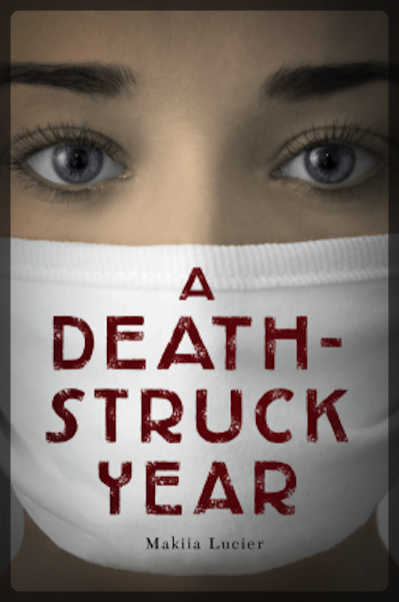 A Death-Struck Year will be released on March 4th, 2014. Author Makiia Lucier will be doing an Ask Me Anything in /r/books on Reddit at 12 pm ET on March 4th. Essentially, people ask Lucier anything and she answers.